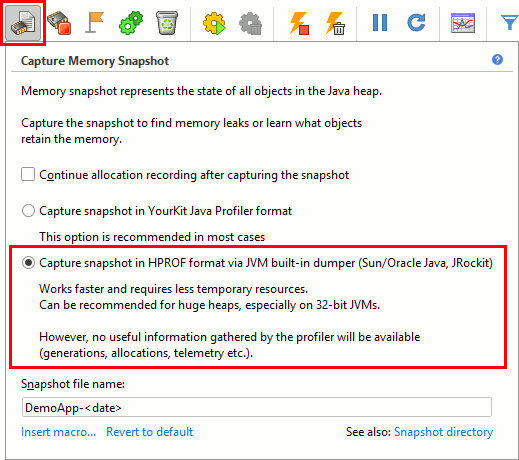 Java has a built-in feature for dumping heap snapshots to files in HPROF binary format. You can analyze these snapshots using all of the powerful features that YourKit Java Profiler provides for its own memory snapshots. Hint: to learn the PID (process identifier) of running JVM, you can use jps or jconsole JDK utilities. The benefit is that memory can be analyzed on demand with no additional configuration of JVM or Java application. You can dump memory of any running instance of JVM that supports this feature. 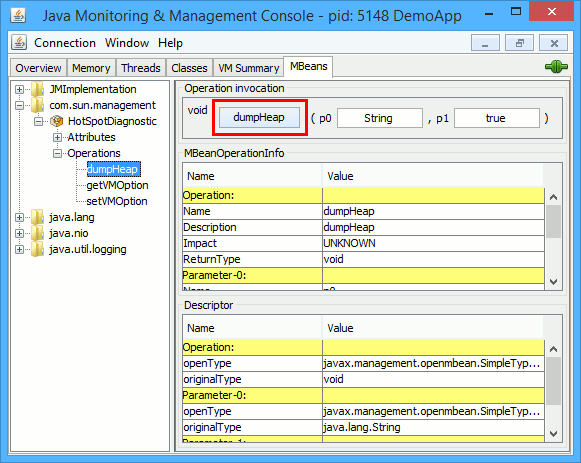 Java utility jconsole allows you to connect to a running Java process for monitoring and management. This approach has a lot of drawbacks and is not useful nowadays, but is mentioned here to show the complete picture. Some HPROF snapshots do not contain values of primitive types. When such snapshots are opened in the profiler, values of java.lang.String's will not be available.